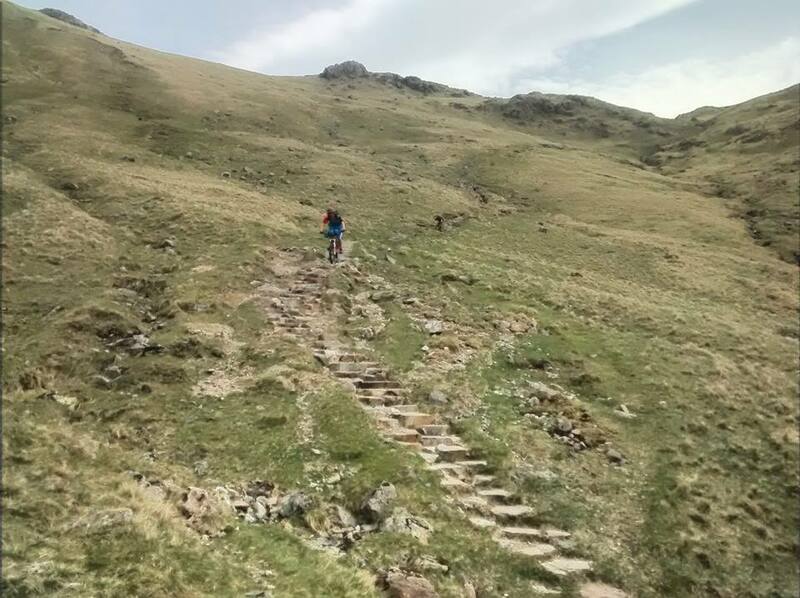 Andy K gives us the low-down on his biggest ride of the year, a two-day loop around some of the Lake District’s best high-level bridleways. In the Lake District it’s not just Christmas that comes but once a year – it’s also an annoying feature of Summer, or whatever fairly stable period of weather eventually turns up to resemble it. Unlike Christmas however, its timing isn’t conveniently marked on a calendar to allow easy planning and co-ordination of suitable activities like riding bikes. In 2015 for example, summer sauntered along in about October. 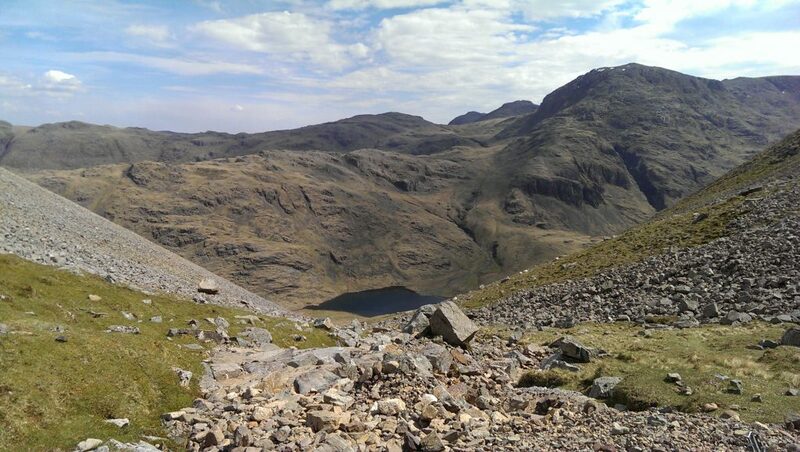 Therefore you can imagine our surprise when a long planned Lakes epic, including an overnighter at Coniston YHA, turned out to be smack in the middle of the longest hot spell Cumbria has seen in two years. The original plan of six-plus riders has long since gone to pot, with Andrew J foolishly double-booking with family commitments, thereby also not bringing a couple of mates, and Stace recovering from a bout of the lurgy and deciding on a relatively easier pair of South Lakes rides; Grizedale and a lap of Nan Bield – which didn’t turn out to be much easier anyway. Saturday morning saw us pulling into Bleach Green car park in Ennerdale just after 9.30am. 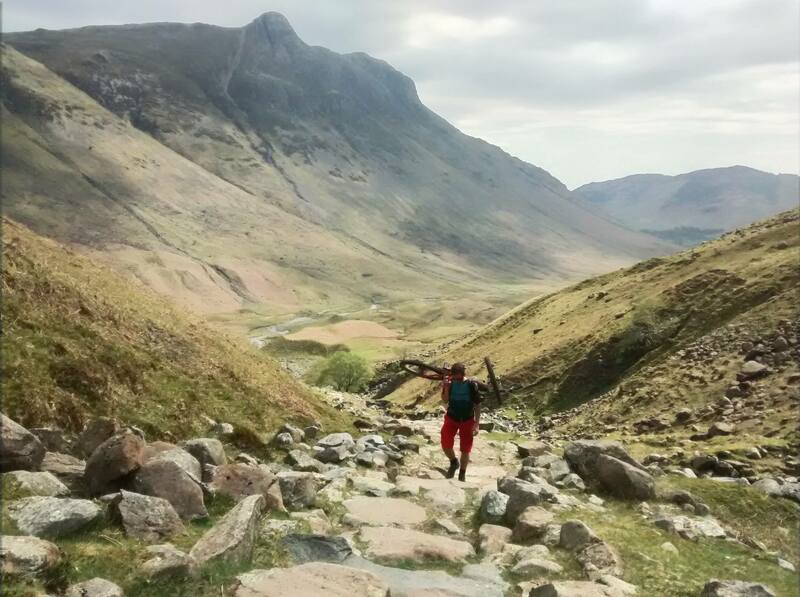 Andrew J had, in the end, stashed his car at the first day’s mid-point in Wasdale, meaning he could join us for a few hours, leaving just myself and Chris to complete the full two-day loop. It was already nearing 18°C and promising mid-twenties, even higher on Sunday. 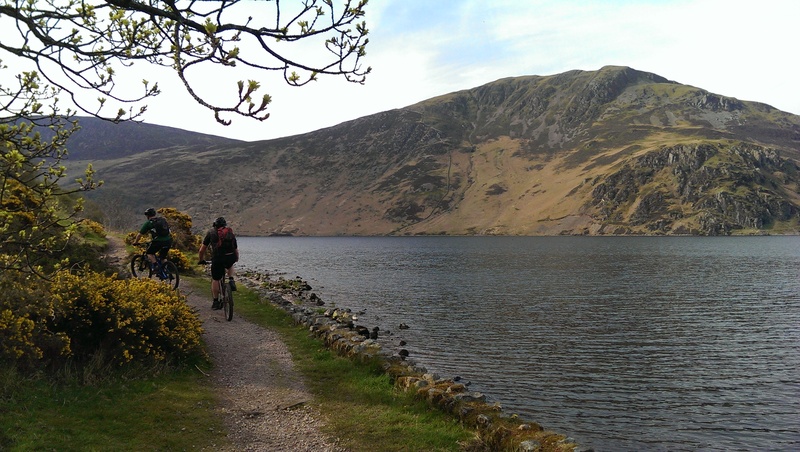 Cycling up the long Ennerdale valley gave plenty of time to consider the route. It was a baptism of fire for me, having been splitting my spare time between house renovation and marathon training since Christmas, the cycling had taken a back seat – but with the running out of the way, and the arrival of some glorious weather, I wasn’t missing this trip for anyone. Day one consisted of four passes. Heading south across the valleys of the western Lakes we would cross from Ennerdale, over Wasdale, Eskdale, and Dunnerdale, before finally descending into Coniston. We passed Black Sail YHA after an hour, relieved that the long fire road spin up the valley was over. Shouldering the bike for the first time in months to ascend the pass brought a few doubts however, it had certainly seemed to gain a few pounds in the intervening months. I hoped I could make it through a pretty portage-heavy weekend and I consoled myself with the fact at least today’s passes would mostly be pushing rather than carrying, so the burden would soon be over for now. Black Sail has seen its share of attention from the Fix the Fells campaign over the years, but to be fair, as a descent it still works really well, the top section is pitched stone, but a bit of skill or luck will see you through the majority of it, after which the flow picks up and there’s some great traverses and corners, although its worth looking up now and again to check out the views. Lower down some new fixing work sees the introduction of a new type of drainage ditch, a cycle-friendly one with sloped sides rather than the usual square sided trench! Perhaps a new method for bridleway use or perhaps someone’s been listening to wider user groups, who knows, but most welcome nonetheless. A quick sunscreen and tyre pressure-based faff at Wasdale Head, and we were on our way to pass, or rather plateau, number two; Burnmoor and its accompanying tarn. Normally boggy for 95% of the year, a fortnight’s dry weather had seen it turn merely a bit draggy, rather than its normal wheel-sucking self, and after a bit of effort, we crested the grassy rise by the black tarn to start zipping down the broken, nadgery path down to Boot. This descent at least, could still be counted upon to throw some mud up our backs, otherwise patrons at the Woolpack Inn lunch stop might have otherwise thought we’d just spun up the road from the car. While lunch was being arranged, I set to work on the weekend’s only mechanical, a broken front mech cable ripped out by a hastly reattached drybag from the last stop. Apparently carrying a spare gear cable is a rarity among my fellow riders, but I’ve had cause to use one a couple of times in the Alps, and weighing nearly nothing, makes a useful addition to the Epic Ride Breakdown Kit. Lunch ingested and having regrettably but wisely steered clear of the fine ale selection, we bid farewell to Andrew J and set off for the next crossing into the wilds of the Duddon valley. By this time we realised the forecast 50 per cent chance of thunderstorms had turned out to be more like five per cent, so we could have shed a couple of pounds worth of extra layers from our overnight bags. Still, be prepared and all that. Turning right after the thankfully brief 1-in-4 first ramp of Hardknott pass, we rose over Ulpha Fell in the heat of mid-afternoon, glad to top out and regain the breeze again. We were surprised to find a piece of compacted gravel bridleway leading through the top plantation that seemed to have been lifted straight out of a trail center, but it provided a few easy meters until it meets the now clear-cut forest road. The bridleway itself shoots off down a break to the right towards Grassguards, and after a quick discussion of half-remembered intel on if it was passible, we hedged our bets and reasoned it was dry enough to take a chance. In the end it was diverting enough, not a brilliant bit of singletrack, but better than the fireroad, and passing Grassguards, we headed for the brilliant woody switchback descent next to Wallowbarrow Crag. We paused again once we arrived back on tarmac at the Newfield Inn. 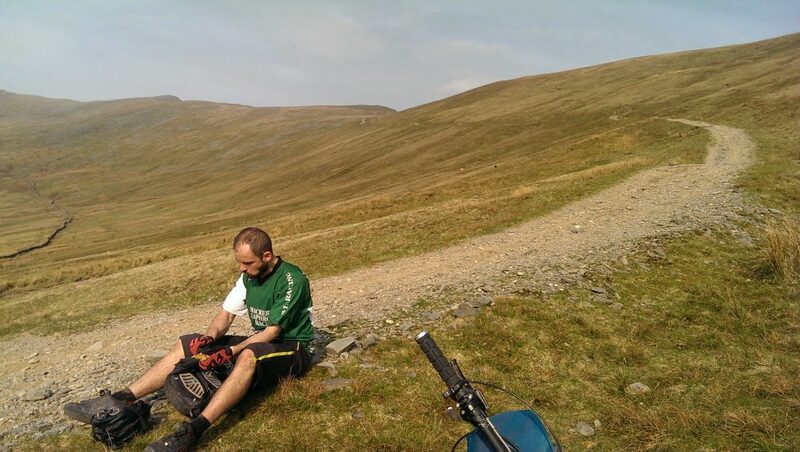 Knowing that the big final push was upon us at Walna Scar, we decided to take on sugar and salt (pop and crisps). Sitting on the grass of the beer garden, my right leg decided now was a good time to start cramping up, hastening our decision to push on. Although the spin up the road loosened my leg up, at this late stage of the day, getting up and over Walna Scar couldn’t come soon enough. It doesn’t help you can see pretty much the whole climb from the bottom. Eventually we made it, but after a full day’s graft under the sun I was ready for the end. 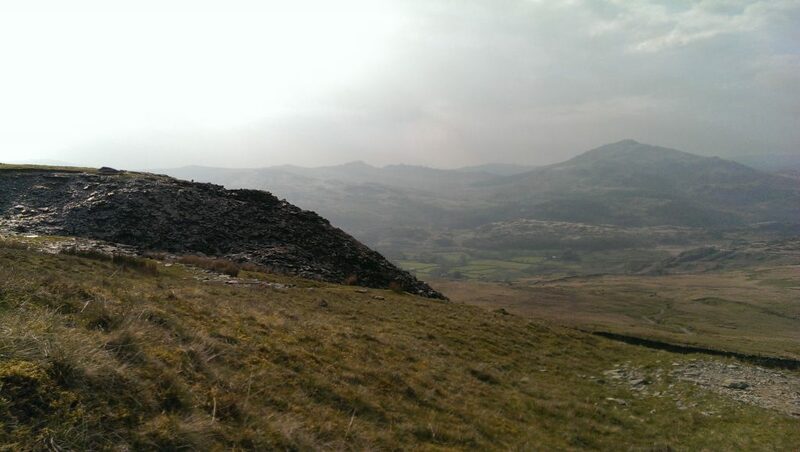 Firstly, however, we surveyed the 600m drop into Coniston from the top of the pass. The top was rebuilt a few years ago, but now, with a few years erosion and weathering, it’s roughing up nicely. Sadly, on account of the previously mentioned house renovation, I’m not making the pilgrimage to the Alps this year, but on this weekend, it seems the Alps have come to me. Dropping into the trail, at turns fast and rocky, sun getting low behind us and temperatures well into the twenties, I’m getting flashbacks to previous alpine trips. A quick dog leg from the carpark to pick up the decent to Bowmanstead sees the illusion reinforced, a lovely rocky techy path between dry stone walls, cutting through clipped paddocks and stone-build cottages, just like arriving into the back of a small French hamlet. All it was missing was the chiming of cowbells and an inconsiderately placed electric fence across the path to get tangled up in and the picture would have been complete. Eventually we located our digs for the night, and our errant riding partner. The continental flavour continued for a good few hours into the evening, as the local brewery tap provided much needed cellar-cold beers and dinner to our outside table. This was shaping up rather well. A quick glance out of the sunny dining room window at Coniston YHA confirmed that we were in store for another cracking day on the hills. Extra toast and a full English were well advised. Stace left Chris and I to pursue his own hiking explorations around Nan Bield, while we prepared to head back north, firstly to Langdale via the pleasant and well-worn bridleways of Hodge Close and Little Langdale. We wound our way up Langdale towards it’s seemingly vertical headwall. I knew it was nearly time to start shouldering the bike again, but what made the thought rather more unpleasant than usual was knowing that our route up was Rossett Gill. I’m no stranger to the area, but my main recollection of this end of the valley is a stack of orange contours so tight it’s basically a solid block of colour on the map. The initial pull up to Angle Tarn is a solid 400m of straight up, and with the south-facing rock having already baked for six hours in the morning sun, it felt every one of them. Cresting the top in a sweaty mess, it took a good few minutes to appreciate the amazing setting of the Tarn and the eastern Scafell massif. After the last couple of hours’ graft, the short descent to the tarn and push up the other side to Esk Hause was light relief. 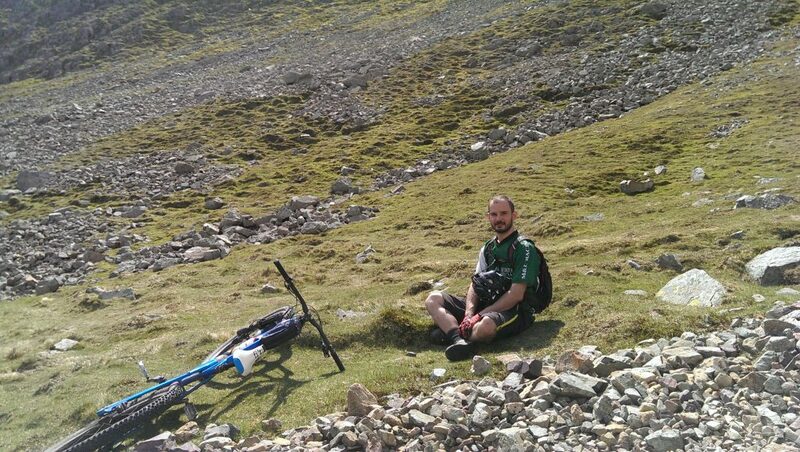 The high col also mean a spot of lunch, and contemplation of the fine decent to follow. I don’t know how many people ride this per year. Possibly quite a few, but I’ve never seen anyone else on these upper reaches until you make Styhead Tarn and the Tour-de-Gable route. Those that have made the effort though, will know how brilliant these two-and-a-half kilometres are. Plenty of techy bits, but still with loads of flow and space to get creative. 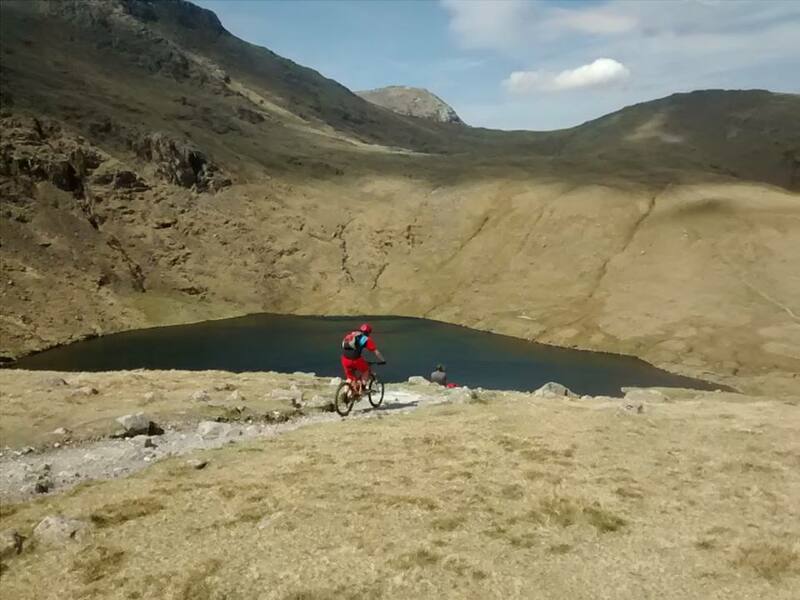 Combined with the far-reaching views, it really is in the top draw of Lakes descents in my book. Styhead Tarn and its multitude of tourists provided a welcome rest and a chance to ease our overheating legs and bodies in the water. We glanced over our shoulders at the possibly fraught scree climb up Aaron Slack between Green and Great Gables, and tried not to think about it too much. Better to dwell on the matching prize over the other side back down to our starting valley. Aaron Slack was as toil-laden as we’d expected, but given our not insignificant altitude at Styhead, another 300m of climbing passed mercifully quickly. Another col gained, we finally peered back down back to our starting point, still several miles’ distant at the far end of the valley. More closely, we apprehensively prodded our toes in the deep scree that constituted the first few hundred meters of decent and wondered if it would be brakes or steering that would be the least effective for the next few minutes. A brief traverse brought us to the top of the Tounge down to Black Sail, the track down starts imperceptibly and a looks no different to any other sheep trod in the grass, but soon becomes more obvious if you stay right of the knoll, and then increasing picks up pace into a rolling, grassy, almost slopestyle-esque course between the old mine spoil hummocks. A better rider than me would have a field day down here, even so, getting some modest air of a perfectly shaped natural hip leaves me feeling like a hero and scanning ahead for the next possible improvised lip. We’re still smiling as we arrive at the remote Black Sail YHA. We cool down just enough to allow us to enjoy a self-service tea and cake while chatting to the many Coast to Coast walkers milling around. We can sense the end, but lying in the sun outside the hut provides another excuse to put it off for a just few more minutes. Will we get another weekend like this this year? Cheers for this post. I did an adapted version of your route this week, interpreted from the clues in the writeup but starting in Coniston & staying in Black Sail. Getting into Black Sail was a bit of an adventure with both sugar levels & sunlight fading late in the day but we had a blast! No probs mate, its a fab trip, and I’m happy someone else took the time to enjoy it. Having Black Sail as the overnight will certainly add an extra degree of wildness too!